Fetch that single malt from the liquor cabinet, pour yourself a chota peg, put taper to your havannah and sit back in your favourite armchair and return to a time when the Atlas was swathed in the red of the British Empire. "Peace" is that brief, glorious moment in history when everybody stands around reloading. Our merry band of tabletop warriors were introduced to the excellent Fire and Fury ACW rules many years ago by fellow gamer Dave 'Tex' Houston. After amassing some formidable 15mm armies and investing in suitable terrain we spent countless happy hours forcing river crossings, charging log breastworks, defending snake-fences, sunken lanes and fields, marching along turnpikes and generally getting into the spirit of this fascinating period. The obvious attraction of 15mm was the ability to refight large battles, within the confines of our 8' x 6' table, for relatively minimal financial outlay. Alas, at some stage, we were smitten by the deadly 'twenty eight militis bug'. This insidious virus attacks the brain and renders otherwise sane gamers incapable of wargaming unless their armies are an exquisite and thoroughly authentic representation of their chosen army in 28mm scale. In its more advanced stages the victim is rendered incapable of even touching any figure of an 'inferior' scale. Sadly the dejected 15mm pygmies were left to languish in their storage trays whilst their gorgeous 28mm giant cousins waged their dioramic battles. It was in a moment of nostalgic reminiscing that I decided to arrest the ravages of the 28mm virus by staging a 15mm Regimental Fire and Fury game as my choice for our fortnightly battle. Despite the fevered protestations of our most afflicted colleague and with the assistance of our resident ACW experts I,...well er actually... they, came up with a fictitious scenario and the Orders of Battle for a medium sized encounter battle. 'THE BATTLE OF BLACKWATER CREEK'. Blackwater Creek,(slow-moving and fordable along its entire length). The Harrow Turnpike which runs pretty much parrallel with the sluggish Blackwater Creek crossing it at the stone bridge and heading south. Riverton Road heads through the town crossing the creek just south of the town and carries on in a Southerly direction. The ridges at either end of the table merely represent the boundaries of the table and offer no terrain advantage. Crossing the creek or moving through woods or broken ground incurs the usual movement penalties. We deliberately kept the battlefield as uncluttered as possible to allow ease of movement yet still retain some resemblence to the American Civil War countryside. 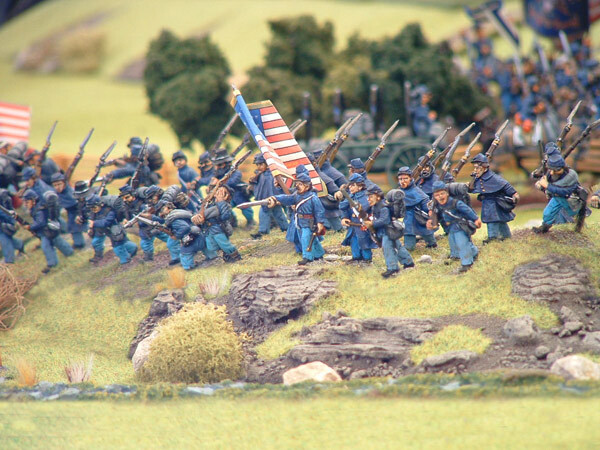 We used the Orders of Battle from the Fire & Fury, 'Little Roundtop', scenario for no other reason than the numbers looked about right for a medium sized stoush. The rough outline of the scenario is that the Confederate Army is advancing deep into Union territory and are hoping to resupply at the town of Grantville, plus secure the crossings along the Blackwater Creek before the onset of the inevitable rainy weather which turns the usually sluggish creek into a raging torrent. Naturally the Union Commander is charged with thwarting their nefarious plans and defending the good citizens of Grantville from the nasty rebels. Whilst the Confederate infantry outnumber the Union, the Union commander has at his disposal nearly a third more artillery. Neither side possess a cavalry force. The Confederates are nearly all Crack troops whilst the bulk of the Union troops are Veterans or Trained. Both sides may be deployed up to 16 inches from their respective baselines. As you'd expect both sides waste no time in advancing toward their key objectives. I wont bore you with an account of the initial manuevering, but intstead, will teleport you to turn 3. As can be seen from the picture the bulk of the Confederate Force (Benning and Robertsons Brigades) have advanced to the edge of Blackwater Creek and have begun trading fire with the Union troops (Wards Brigade) who have formed a defensive line along the Harrow Turnpike and the Riverton Rd Bridge. 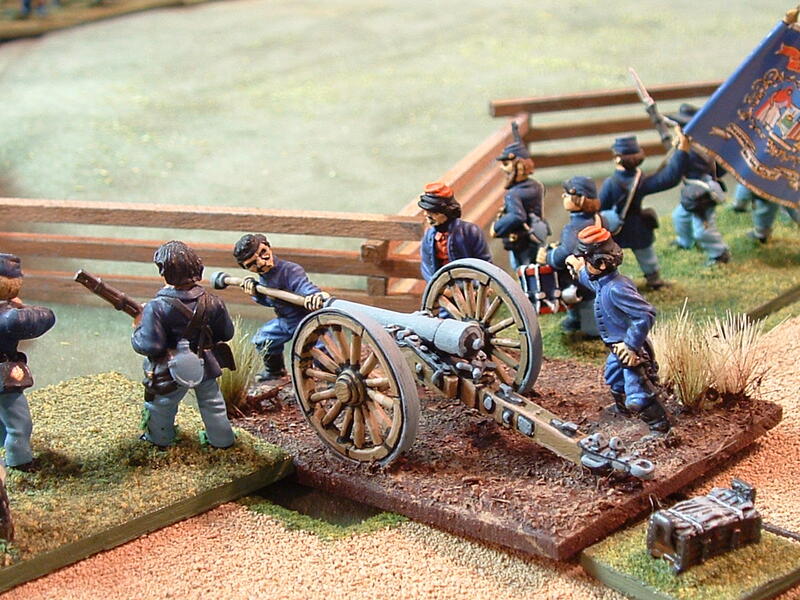 Laws Brigade of Alabamans have been tasked with the capture of Wilsons Crossing and have deployed their battery of two guns on the hill behind them. their Right flank Vincents Brigade have been sent to defend Wilsons Crossing. The thunder of hoof beats and jingle of harness signals the arrival and rapid unlimbering of Union Gun Batteries. On Turn 4 hell breaks loose as all along the line troops engage in close to medium range firing, both sides intent on weakening the others resolve to stand. On the Union Left flank Ward's Artillery (Smith's Battery) have brought the guns up to very firing line to support the infantry and commence a lethal bombardment of the boys from Texas and Arkansas. Unfortunately the hail of lead is not enough to stop the Confederates pressing on with a well handled crossing of Blackwater Creek. In the Confederate centre Bennings Brigade similarly wade across the Creek intent on sweeping aside the enemy and capturing the town. On the Confederate Left Law's Brigade is heavily engaged with Vincent's Brigade in a struggle for Wilsons Crossing, the Tiger Zouves make a fearsome sight in their natty straw boaters and pyjama pants....sorry Rog, I couldn't resist an under-hand snipe at your beloved Zouves. Actually they wreaked havoc on the men from Maine with some galling fire.....so they're no pussies. Turns 5 & 6 can best be summed up by a series of charge and counter charge across the entire front as the Confederate assaults are checked only to rally again and go back in with support from fresh troops from the reserve. The Union seems to get the worst of it as casualties rapidly mount and units become worn. The 124th New York Regt have taken over 60% casualties! and are spent. They're only holding on due to some lucky morale dice by your's truly. Robertsons Brigade of Texans 'good ol boys' are really taking it to the Yankees and, with some uncharacteristically (for Wayne) outstanding dice throwing, succeed in driving the enemy back. Nice of you to get your 'Dice Mojo' back when you're attacking me mate! Turn 7 is really the tipping point for the Union as the Confederates have succeeded in throwing both Wards Brigade back and now control the Riverton Rd Bridge. On their Left they have wrested control of Wilsons Crossing from Vincent's hard pressed Brigade. In the centre the Union are also giving ground and the ragged state of the Brigades is making it difficult to rally the men. So with nightfall approaching it fell to the umpire to make a decision. After a quick tally of points for objectives gained and casualties inflicted it was declared a victory for the Confederacy. All and all a thoroughly enjoyable game fought to a decisive conclusion in an evening. And now for something completely different.....28mm eye candy just to show we try to cater for all tastes. Now that was a well written batrep and damn good pictures...more I say! Good to see proper 'manly' activities getting a look in, in the fine weather ;-) I know its difficult to sit inside and paint when the sun shines outside! Yes your fellow fusilier, Roly, joined the forces of righteousness and unity to take up arms against the Secessionist rabble, clearly a man of impeccable honour and a proper chap much like myself. What a spectacular set up you have there Sir! Tremendous report and a wonderful collection of miniatures. The trout looks like a keeper too. Great paint on the fisherman figure. Almost life like! !